The practice of kneading bread dough dates back thousands of years and is a step that cannot be overlooked by bakers. 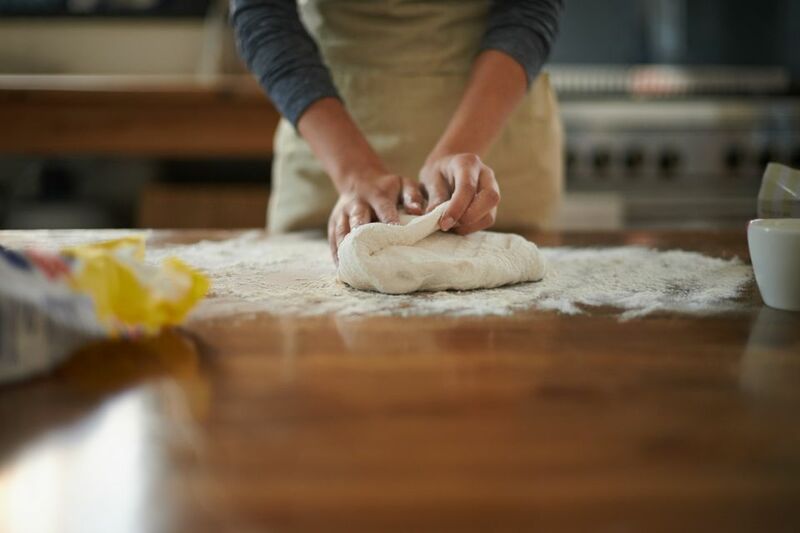 And while mixing dough ingredients sets the stage for the bread-making process, the art of kneading provides both strength and structure to the dough. Wheat flour contains two proteins—gliadin and glutenin—which combine to form gluten. When bread dough is first mixed together, the proteins are mangled and knotted in no particular order. But as the dough is kneaded, the proteins line up to form giant chains of amino acids, creating a matrix within the dough itself. It's this matrix that allows the dough to trap gas released by the yeast or other leavening agents, resulting in the rise. Kneading dough can be a good workout (if you look at it that way) or you can enlist your trusty mixer to do it for you. Either way, kneading is a science and the tactics involved are specific for a delectable crust and crumb (the bread's interior). Kneading dough by hand is the easiest way to control the bread's consistency. While there are several techniques to hand kneading, all of them involve folding and stretching the dough repeatedly. Kneading a basic bread dough by hand takes about 10 minutes to form adequate gluten. Slowly adding flour to the dough as it is kneaded prevents sticking—but don't add too much. An excess of flour can create a stiff, dry dough. A perfectly kneaded dough springs back when poked with your finger and will feel soft and silky in texture. The dough can also be kneaded by using a bread machine, a stand mixer, or (for smaller loaves) a food processor equipped with a dough hook attachment. Bread machines are also completely automated, making them almost fool-proof. But don't take automating the process for granted—it's easy to over-knead the dough in a mixer and kneading with a stand mixer, for instance, is much faster than kneading by hand. For best results, knead dough on low for three minutes until it cleans the side of the bowl. Then, continue kneading for three to four more minutes until the dough forms a ball. Kneading in any automated mixer should not take more than eight minutes in total. If you peter out and don't knead your dough enough by hand, or if you don't allow it enough time in your mixer, the dough will lack strength. It is a tell-tale sign of not enough kneading if your bread dough cannot hold its shape or acts listless and fails to inflate. Instead of rising, the dough will spread out flat. The dough may even fall back onto itself and collapse as the gases produced by the yeast escapes. Once baked, an under-kneaded bread loaf will be flat and dense in texture. If kneading helps line up proteins and form a gluten matrix, it seems counterintuitive that no-knead bread can still form light, fluffy loaves. However, gluten can form naturally by allowing the dough to ferment for 12 or more hours. This tactic gives both the yeast and the enzymes enough time to work their magic. The enzymes within the flour break down the knotted up proteins, allowing the gas produced by the yeast to inflate the dough and make it rise. Think of it as a slow-motion kneading. If you have the time, fermentation provides a no-fuss option for creating a perfect loaf. The acidification of this process makes the bread easier to digest and sometimes tolerated by those with gluten sensitivities.